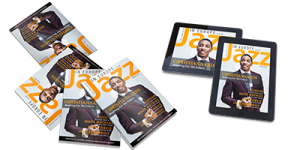 This article has been posted courtesy of Lynn René Bayley of the The Art Music Lounge. 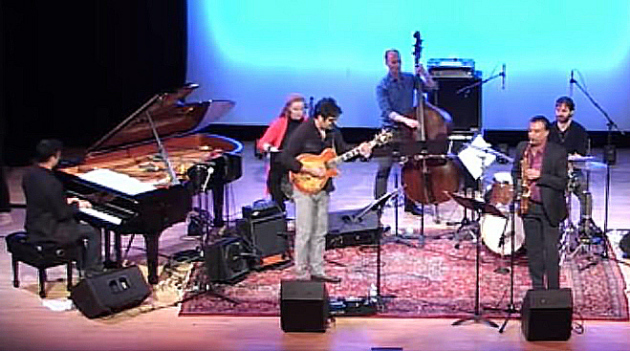 It’s not often nowadays that “all-star bands” live up to their hype, but when you have a band that includes three such prominent, powerhouse improvisers as guitarist Rez Abbasi, pianist Vijay Iyer (see my extended comments on his work in From Baroque to Bop and Beyond, Chapter XVI, pp. 438-442) and alto saxophonist Rudresh Mahanthappa (of Bird Calls fame), it’s difficult to describe it as anything but. 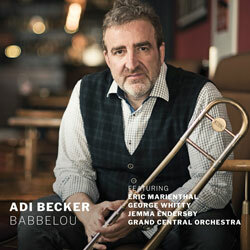 Abbasi’s band Invocation has been working in the field of Eastern music-influenced jazz since 2008, and this is their third album in that style. 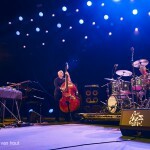 For those of us with a view of musical history it can be compared to the performances of Don Ellis’ Hindustani Jazz Sextet of the 1960s, which is where the late trumpeter learned to swing in unusual meters, or the large body of work produced over the years by Lebanese musician Rabih Abou-Khalil. 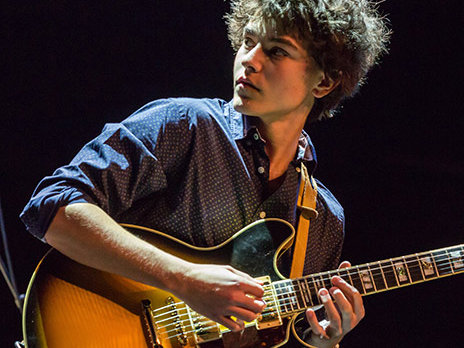 It also doesn’t hurt that Abbasi, unlike most of his American counterparts, is a powerhouse jazz guitarist who plays with the drive and power of late Django Reinhardt, Charlie Byrd and others who followed in their footsteps. No shrinking violet is he, but a musician who is not afraid to play his solos with power and emotion. 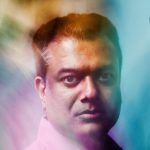 Indeed, the one musician in the group who retreats from the sound barrier when he plays is Iyer, which isn’t at all surprising considering his classical background. 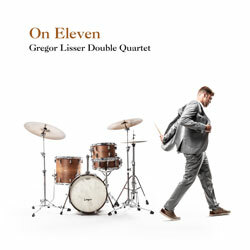 His solos are remarkably interesting, combining elements of Monk and Bill Evans (two of his early heroes), but they are cooler than the saxist or guitarist. Iyer is particularly effective on the title track, where the voltage is reduced somewhat. 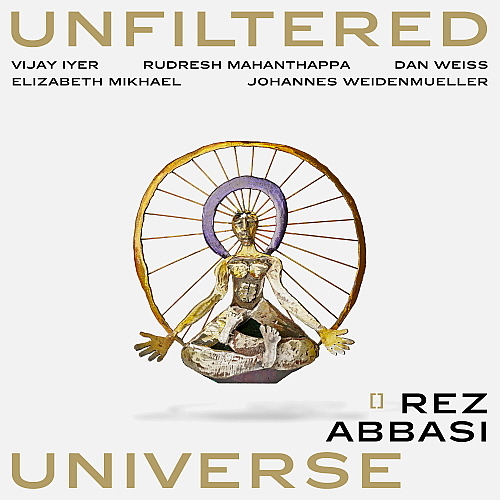 Abbasi and Mahanthappa play an interesting yet quirky long-lined melody in unison which then leads into Iyer playing interesting figures while the guitar-sax duo is joined by Elizabeth Mikhael on cello playing a sort of ground bass behind them. Since the Hindustani Jazz Sextet left very few recordings, mostly from live performances, it’s difficult to say what their “book” was really like, but judging from Abbasi’s pieces on this CD the music here consists of real compositions. Much more has been written out and preplanned, using South Indian rhythms with American harmonies. Iyer’s solo is remarkable, a single-note excursion that cuts through the complex harmony and rhythms with ease. His fecund imagination never ceases to amaze me; nothing he plays is trite or derivative, yet it always sounds as if he had the entire solo mapped out in his head before he even got through the first three bars. Following this, Mahanthappa ramps up the tempo in double time with a long string of repeated octave flutters. The tune titled Rez Intro sounds as if was played backwards on a tape player…maybe it was! Thin-King is a medium-tempo romp for the band, and even Iyer plays here with a higher level of energy to match the intensity of the others. 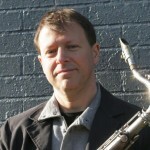 Johannes Weidenmueller contributes a nice bass solo as well. There’s a really nice tricky passage in the coda to wrap things up. Turn of Events, the longest track on the album at nearly 12 minutes, starts with slow, out-of-tempo musings from the various musicians, mostly guitar and alto sax while piano, bass, cello and drums drop notes in here and there as filler. Eventually it develops into a really lovely tune, essentially in A minor, out of which development occurs with the naturalness of a flower’s petals opening up. 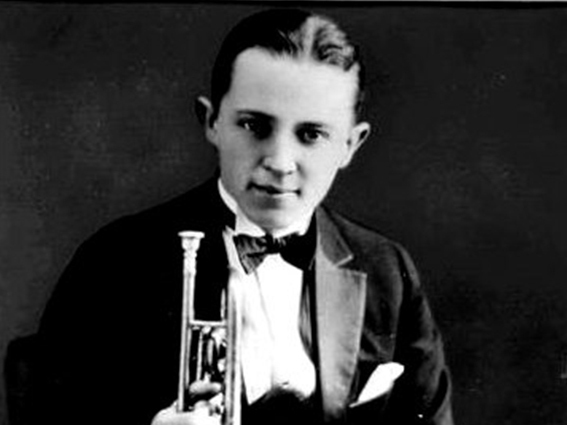 Every note played by each band member contributes to the whole, and even the individual solos seems specifically tailored to the surrounding structure. Indeed, the quality of the music is so high that picking apart individual moments here seems counter-productive. Iyer’s solo contains some echoes of Lennie Tristano, which isn’t a bad thing. This leads into some delicate pluckings, and eventually a pizzicato solo, from cellist Mikhael, after which Iyer plays the piano with one hand while damping the strings inside the piano with the other. This is followed by a guitar-saxophone passage which is a variation on the original theme, again sounding preplanned, with nice ground bass bowing from Mikhael. Then, it just stops dead! Disagree to Agree begins slowly, and here the rhythmic complexity seems particularly dense, especially in the introduction and opening chorus. By 1:50 we’ve suddenly entered a hard bop mode despite the extended bar lines. Iyer contributes another superb single-note solo. By the time Mahanthappa enters for his hard-driving solo, both the tempo and the intensity of the music have been ramped up a couple of notches. What a wonderful player he is! 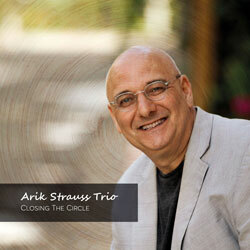 Abbasi plays with equal intensity, taking care to control his instrument’s sound superbly. Then comes another one of those apparently written-out guitar-alto passages, this time turning into the ride-out. 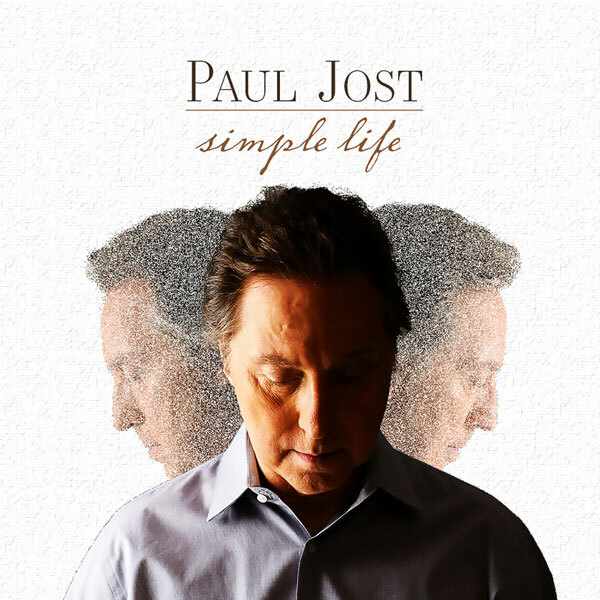 The album concludes with Dance Number, a loping, relaxed piece at medium tempo that almost sounds informal yet shows signs of careful writing and thematic balance. In this one the band seems to be staying in one chord or mode much of the time; there is less harmonic movement as the soloists take their turns, adding interest in the context of their individual choruses rather than in the basic structure. Some of Mahanthappa’s figures reminded me of belly-dance music although for the most part he is playing some very complex double-time passages that go “outside” fairly often. The volume drops for Iyer’s solo, the eye in the midst of this musical hurricane, although towards the end of it he increases the volume as Mahanthappa plays soft long notes behind him. Abbasi and the saxist then ride us off into the sunset. 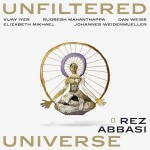 Unfiltered Universe is an unqualified success for Rez Abbasi, easily one of the most spectacular albums so far this year. Featured Gig | Tom Ibarra at the Sunset-Sunside in Paris.